Detta är ett zoom-objektiv som tillverkats av Tamron och modellen lanserades 2008. Om du köper detta objektiv följer det med ett motljusskydd, vars modellbeteckning är "DA09". High resolution full-frame digital SLRs demand the optical quality for which the SP 28-75mm F/2.8 XR Di is famous. 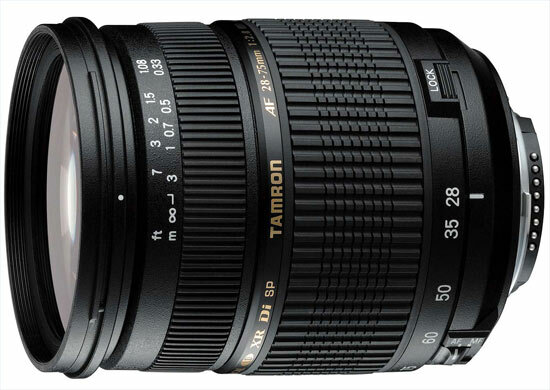 Another in Tamron´s selection of fast and constant F2.8 maximum aperture optics, its speed benefits photographers in several ways, including the ability to render cluttered backgrounds well out of focus, added low-light shooting freedom and a brighter viewfinder image. Featuring XR (Extra Refractive Index) and LD (Low Dispersion) glass in an optical formula employing 16 elements and 14 groups—assuring sharpness, optimal contrast and color accuracy, rendering striking images. Sophisticated aspherical element design and internal focus contribute to barrel size that belies a typically large F2.8 optic. With both an ideal picture angle range, fast aperture and outstanding optical properties, it´s no wonder that so many SP 28-75mm F/2.8 lenses can be found in the bags of noted wedding and corporate shooters. The smallest and lightest standard lens of its class. Its luminosity makes ” Available Light” photography an absolute pleasure. It belongs to the Super performance ( SP) class of Tamron lenses distinguished by ultra high optical and mechanical quality. It has very good resolution capability, strongly reduced light fall off up to the edges, minimized chromatic aberration and very good stray light behavior. Sharp and excellent pictures are the result. Furthermore, the depth of field which is rather wide due to the construction of the digital image sensors can be reduced by the big diaphragm aperture. This leads to new creative possibilities (e.g., motive stands out in front of a dramatically attractive blurred background). Please note: From June 2008 available with a „built-in“ motor in order to also serve users of new Nikon cameras which require a „built-in“ such as the Nikon D40, D40X and D60. The new version (Model A09NII) replaces the previous version (Model A09N). " Övrigt (eng): Model A09NII , adds autofocusmotor to Nikon cameras. Canon-owner get similar performance with the older model with the same name.